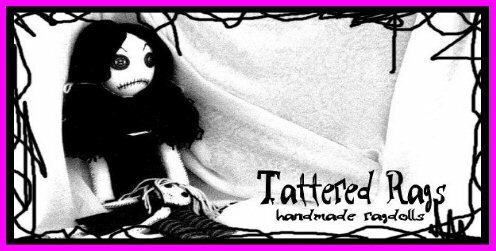 Welcome to Tattered Rags dot Net, home of Jodi Cain's dolls. The inspiration comes from my interest in all things creepy, horror, gore, macabre, and my intrigue with both gothic and punk fashion. The dolls as well as their clothes are completely hand stitched and I always use vintage buttons making them each unique and one of a kind. They stand around 22 inches tall and are stiff stuffed with fiber fill and wire. Visit my Doll Gallery! There you'll find a wide variety of horror related dolls, gothic dolls, holiday inspired dolls, and just plain creepy dolls. Dolls can be purchased, shipped Priority and Airmail worldwide, here on my website by clicking Shop, where you can pay securely Via Paypal. Dolls can also be purchased in my Etsy Shop. I also take custom orders to recreate any of the dolls in my gallery, or I can turn your ideas into a rag doll as well. You can learn about how to purchase custom made dolls by visiting my Custom Orders page. I absolutely adore making dolls, and I am always thrilled to ship them off to their new homes. *NOTE* E-mail me with questions or custom order inquiries. Follow me on Instagram @JODICAINDOLLS! Click here to add me on Myspace! Copyright � 2003-2019 Jodi Cain All Rights Reserved!